Hooper, D. (2019). A case study of learner identity and motivation in a social learning space. 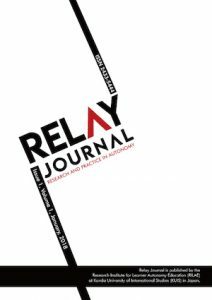 Relay Journal, 2(1), 118-121. This case study represents one element within a larger ethnographic investigation into learner behaviors and identity within the English Lounge, a social learning space in the Self-Access Learning Center (SALC) at Kanda University of International Studies (Burke et al., 2018). Within this larger project, I interviewed Ryunosuke (pseudonym) twice as part of 30 semi-structured interviews conducted over a roughly one year period with 15 frequent users of the English Lounge. Stemming from an initial observation study of student behaviors in the English Lounge area, we were able to categorize regular users of the space into two distinct groups. The first was a core group of users who spent time at the English Lounge on a daily basis and appeared to be comfortable and ‘at home’ in the space. We also identified an active group of frequent users who would attend the Lounge just once or twice a week. We designated Ryunosuke as a member of the latter ‘frequent user’ group. I was assigned Ryunosuke as an interviewee because he requested that his interview be conducted in both English and Japanese and I have a reasonable level of Japanese fluency. I had never met Ryunosuke prior to our interview but he relaxed quickly after some small talk and was very talkative and open both of the times we met. At the time of our first interview, Ryunosuke was a sophomore student majoring in English. Although he was familiar with many of the central members of the English Lounge community, he did not consider himself to be a member of this group. Ryunosuke was very open and gregarious in our interviews and was keen to give me his insights into his experiences in the English Lounge and factors underlying his motivation and learner identity. This case study will explore salient issues from Ryunosuke’s first interview and provide examples of how his perspectives on learning, identity, and the English Lounge shifted through a second interview conducted a year later. In his first interview, Ryunosuke saw the English Lounge as a place where he could practice his English with international students, friends and teachers, who he perhaps perceived as his superiors from whom he could “steal some knowledge”. He also viewed it as a source of motivation that he could access by interacting with the core English Lounge users who he felt were “active” or who possessed certain highly-valued measures of English proficiency such as high TOEIC scores or participation in interpreting activities. He also stated that he viewed the English Lounge as a social, rather than merely educational, space as he would often go there to try and make foreign or Japanese friends. In our second interview, however, Ryunosuke revealed that he had stopped going to the Lounge. He gave a number of reasons for this which tied to many of the issues from his first interview. Firstly, one friend who often went to the English Lounge with him had transferred to another university which Ryunosuke claimed had affected his motivation. Another issue that he raised was that he had come to see the interactions in the English Lounge between himself and teachers/students as “superficial” and not leading to the “deeper relationship(s)” that he sought to establish. Another reason for Ryunosuke’s discontinued participation in the English Lounge emerged from one recurring characteristic of his language learning beliefs. He stated that he had stopped attending the English Lounge due to the fact he had achieved the level required by the university in the TOEFL exam and that this had decreased the perceived role of the Lounge as a place to “steal knowledge”. From both of our interviews, it became clear that standardized tests and formal measurements of linguistic proficiency were key to the way in which Ryunosuke evaluated the ability of himself and others. He described the core members of the Lounge as role models in terms of their high TOEIC or TOEFL scores and admitted that he was, at times, quite competitive with other students regarding test scores. In our second interview, he elaborated on this topic, stating that test scores were a source of self-confidence for him as they provided “visible proof” of his English ability. Ryunosuke’s concern with test scores and his rather instrumental perspective on language learning may stem, in part, from two powerful role models in his life, his older brother and his uncle. Ryunosuke’s brother had graduated from the same university as him and Ryunosuke described how high his English ability was, mentioned his TOEFL study, and talked about his position within “a big company”. His brother, therefore, may have acted as a “near-peer role model” (Murphey, 1998), a figure similar to Ryunosuke in several ways, who Ryunosuke perceived as a success both professionally and in language learning. His uncle, on the other hand, was a more distant but still very influential figure. His uncle was American and, according to Ryunosuke, had “prestige and power” as he too held a position within a large company. Ryunosuke stated that communication with his uncle and cousin was one of the initial motivators that drove his desire to learn English and that his uncle had also given him advice on studying abroad and financial management. Ryunosuke’s brother had guided him in terms of his plans after graduation and had arguably been influential in shaping his world view. While in our first interview Ryunosuke stated that his post-graduation ambition was to move to the US or the UK to work, by our second meeting this plan had significantly changed. He later told me that he had changed his view after his brother had advised him that moving to a less economically developed country in Asia would be good for his career and would give him a “wider view”. This change in perspective, stimulated by a near-peer, also reflects a shift described by Yashima (2009) where a target or “imagined” community is not always clearly defined by learners in EFL contexts. Instead, EFL learners display an international posture where they orient themselves in relation to a broad sense of international community rather than a clear L2 target group. Yashima (2013) also claims that international posture consists of three key traits: 1) a desire to interact with people from outside their own ethnic group, 2) a desire to live or work overseas, and 3) displaying an interest in international affairs. Although in the interview we did not touch on whether or not Ryunosuke was interested in global affairs, we can certainly see compelling evidence of him possessing the first and second traits from Yashima’s model. Ryunosuke’s identity as a language user also showed signs of transition over the one year period between our interviews. During our first meeting, Ryunosuke described how he was aware of two distinct selves he inhabited: a Japanese self and an English self. In some cases, the line between them was becoming blurred. He told me that when he spoke in English, he used a lot of gestures to express himself. However, he also claimed that he was aware that this was sometimes happening when he was speaking Japanese and that his English “identity” was appearing more. However, in our second interview, Ryunosuke told me that he felt that the two “identities” had now merged. He stated that although he didn’t believe his English and Japanese identity were equal, he thought that they were “nearly the same” with each identity crossing over and having an effect on the other. My two interviews with Ryunosuke revealed a multitude of ways in which his learner beliefs and identity had transformed over a one year period. He made the decision to discontinue his use of the English Lounge due to the loss of a motivational figure in his learning, the achievement of certain instrumental goals related to his English proficiency, and disillusionment about the role of the Lounge as a place to build social relationships. In a broader sense, we can recognize significant developments in how he views the target L2 community and his learner identity/identities. However, despite these changes, the influence of certain powerful role models in his life and the value he places on formalized measures of linguistic proficiency remain strong constants that greatly underlie his self-confidence and his establishment of future goals. Daniel Hooper is a lecturer in the English Language Institute at Kanda University of International Studies. He has taught in Japan for 12 years and completed his MA TESOL at Kanda University of International Studies. His research interests include learner and teacher identity, critical applied linguistics, and the eikaiwa industry. Murphey, T. (1998). Motivating with near peer role models. In B. Visgatis (Ed. ), On JALT ’97: Trends and transitions (pp. 205-209). Tokyo, Japan: JALT. Yashima, T. (2009). International posture and the ideal L2 self in the Japanese EFL context. In Z. Dörnyei & E. Ushioda (Eds. ), Motivation, language identity, and the L2 self (pp. 144-163). Clevedon, UK: Multilingual Matters. I’ve met and talked to you a couple of times. When I joined the MA program at Kanda, you have already graduated. Having said that, talking to you, making small talk with you, and your presence itself create a certain ambiance of such a magnetic and friendly space that makes Ryunosuke want to reveal his feelings and show some true colors of his feelings of why he ended up not going to the lounge (though it’s supposed to be comfortable and feel like at home). Back when I lived in the Kansai regions, I was so motivated to learn English by communicating with my so called, “could-be-superficial friends” at an Italian restaurant every Friday. However, in the end, I stopped going there altogether due to similar reasons to his reasons. One was one of my favorite friends left Japan, and the other was my near-role model got married and moved to the U.S. with her husband. So, in the end not only I lost motivation to go there but also, I lost kind of my identity, “me-myself-fun time speaking in English “at the restaurant. I also remember that I used frequent gestures while I was talking to my foreign friends in English. when I was in my early twenties, my own international posture consists of only two narrow key traits: 1) a desire to interact with people only from English speaking countries 2) a desire to live or work only in English-speaking countries. I was not really interested in international affairs besides English-speaking culture. I suppose my-ideal-self was “constantly being with English speaking people”. I somehow assumed doing so made me feel and look cool at the time. (now I love being with anybody from any countries!) However, as I have aged and have worked for both Japanese and foreign-affiliated firms for 10 years, my international posture shifted to show more interests in Asian countries as I have worked for a Hong Kong company for 6 years. I got to know more people from India, China, Hong Kong and others. Although I don’t have much knowledge about learner identity, it made me reflect on my past of how I have accomplished my English language learning (though there’s still more room to improve). How hard it was! I couldn’t see the light at the end of the tunnel in the beginning. Thank you for the opportunity to let me reflect on mine once again. Have you considered your own learner identity when you studied Japanese? Have you thought about writing about it? I would love to hear your perspectives on that. I wonder if you feel different when you speak in Japanese and in English. You might be more reserved?? I would love to read more of these similar articles down the road. Please write more! Once again, thank you very much for this wonderful opportunity to be able to read your article. I enjoyed it. Thank you for your kindness and your insightful comments! I’m really glad that reading about Ryunosuke’s experiences and his evolving perspectives on learning encouraged you to reflect on your own language learning journey. For me, this is where the real value of this type of research lies – providing examples of real-life cases that resonate with learners and teachers and that they can analyze and apply (where possible) to their own circumstances. The accessibility of this data is also a big plus as it has the potential to hopefully chop away at the existing gap between academics and teachers by highlighting the potential relevance of research to their understanding of the classroom (or themselves!). I was really heartened by your comments about how you were drawn to interacting with simply “English-speaking people” rather than a narrow ‘native-speaker’ or ‘inner-circle country’ view of English or foreignness that has been found to be prevalent in Japan (Honna & Takeshita, 1998). Over the two interviews with Ryunosuke, I was interested in how his perspective on this changed. Although initially he stated that he wanted to live in the UK or the US, his view later was a lot broader and he appeared to be more open to interacting with English speakers outside of the ‘native speaker’ construct. As for recording my experiences as a learner of Japanese, I don’t think I’m the person for that job! I certainly would not call myself a dedicated Japanese learner but who knows, maybe one day! Thanks again for your comments and I hope to see you at a conference sometime soon! Honna, N., & Takeshita, Y. (1998). On Japan’s propensity for native speaker English: A change in sight. Asian Englishes, 1(1), 117-134. This is a really interesting case, Daniel, taken from a fascinating study that I’m very much looking forward to reading more about. It can be challenging to get meaningful data from non-users of SALC facilities and services, but this is one of the areas we need to investigate more if we are to understand the reasons behind learners’ active decisions not to use services or frequent areas which on paper we know will be beneficial to their learning. All practitioners who work in SALCs or conversation spaces will know of students that used to come regularly but then just disappeared, and I for one often wonder about the reasons for their sometimes sudden change of heart, and whether there is something I could have done to make their experience more rewarding. Your interviews with Ryunosuke highlight the complex nature of his decision not to use the English Lounge, and the influence of his various beliefs about his language learning. He is obviously someone who is greatly influenced by those around him, whether family members or classmates. Given this strong influence, did you get the sense that he is fully in charge of his own learning decisions, or tends to be strongly led by these influences? It sounds like the transfer of his friend to another university greatly affected his habit of coming to the English Lounge, and he seems to concur fully with his brother and uncle’s ideas about where his future should lie. Do you think he reflects fully on the degree to which their advice/actions fit his own needs? I’m very interested in the comment that he said he had started finding his English Lounge interactions “superficial”. Do you know if he felt equally about interactions he had with other students as well as with teachers? I can understand this view – in my own centre these interactions can indeed be somewhat superficial at first, especially with beginners – but I’d be surprised to hear he felt entirely the same way about interaction he had in English with other students too. Has this feedback been relayed back to the core users – I wonder how they would respond to such feedback? I think this shows the importance of making genuine connections with others, and the influence this can have on our motivation. How do you feel about his decision to stop coming to English Lounge? Was it disappointing to find out about his rather instrumental view of his language learning, or do you concur that the Lounge no longer met his learning needs? If so, what kind of things do you think a SALC can offer to attract these more instrumentally-minded students? I believe we need to find ways to be a broad enough church for all students interested in improving their skills to find their place in our learning spaces. Actually doing so, which might also necessitate changing the image that a space has gained, without adversely affected the good things that are already happening, is a really challenge I struggle with. As Garold Murray (2018) said in his JASAL 2017 conference plenary, and the follow-up paper he wrote, it really is a complex dynamic system! I look forward to learning more about the perspectives of different students through your research – keep up the good work! Thank you so much for your comments on my paper. You raised some interesting questions that really made me reflect deeply on Ryunosuke’s case study. In terms of how much Ryunosuke was influenced by others, I felt that an underlying lack of confidence in himself meant that people he interacted with (his uncle and brother, senior members of the English Lounge, friends, etc.) had a profound effect on his path as a language learner and his self-concept. He would frequently compare himself to others (and predominantly in terms of deficit to them) and appeared to latch onto things like standardized test scores as markers of proficiency when he could not recognize it in himself. Although he had some awareness of his own confidence issues, it would be nice if he could reflect more deeply on the extent to which his language learning career is shaped by interpersonal relationships and whether this is always a constructive practice. I was also surprised about his comments on the ‘superficiality’ of the English Lounge. In the interviews, I believe that he was referring primarily to his interactions with students (although he made one brief reference to teachers). I got the impression that there was a certain incongruity between the motivations of other students who just wanted to attend the Lounge for conversation practice and those – like Ryunosuke – who were more deeply invested in an internationally-oriented possible self. Relating his comments back to the core users is a great idea and it would be interesting to hear their take on it. This is something our research team can maybe work on later! His reasons for stopping coming to the English Lounge disappointed me somewhat but they also revealed the complex and multi-faceted nature of his motivation and how different the nature of the space is compared to a traditional classroom setting. I definitely felt that attending the lounge had more to offer him but that it was kind of a ‘perfect storm’ where several demotivating factors came together and he took that as a sign to leave. In order to attract more instrumentally-minded students to a SALC, I believe that peer-led study groups are one promising option where near-peer role models provide time for coaching sessions for standardized tests, interview technique, and so on. This is going on in KUIS now and this peer tutoring group provides a more instrumental focus while also acting as a way to socialize new students into the English Lounge community of practice. This is one area that I’m very interested in and intend to engage in more research into this type of group in the near future! Thank you again for your valuable perspectives on my paper and I hope to see you at a conference sometime soon!